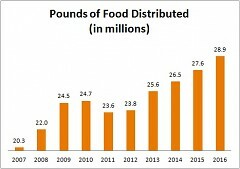 The organization provided 28.9 million pounds of food, making 2016 its fourth-consecutive year of growth. In 2016, Feeding America West Michigan distributed more food than ever before. The nonprofit hunger relief organization, based in Comstock Park, provided 28.9 million pounds of food and household goods to its network of food pantries, soup kitchens, child hunger agencies and partner food banks, a 6.1 percent increase over 2015. 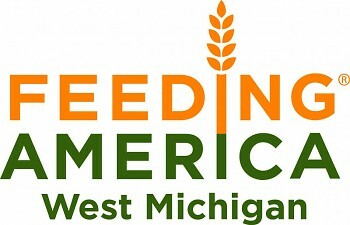 Feeding America West Michigan’s food reaches an estimated half million people each year. Amy Chavez is one of them. Raising three grandchildren on her own and living on a retiree’s fixed income, Chavez receives food once a month from North End Community Ministry, one of Feeding America West Michigan’s partner agencies in Grand Rapids. Inspired by the assistance she receives, Chavez now volunteers at NECM regularly, assisting other clients and translating for the when needed. 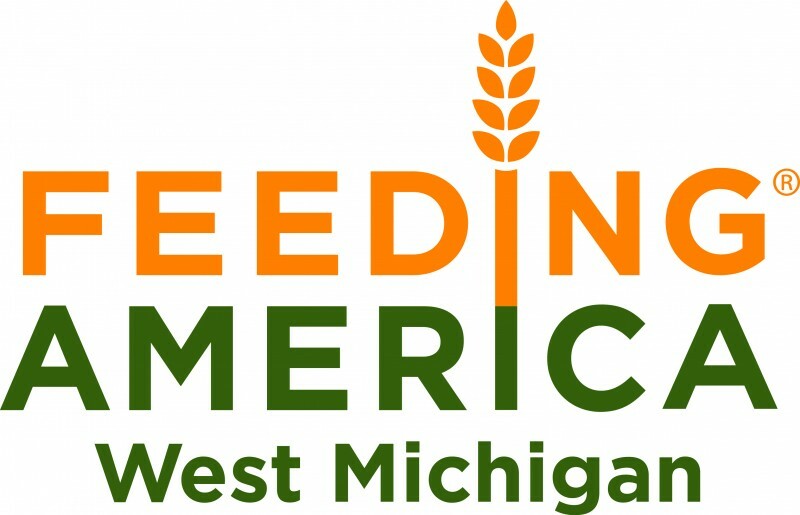 NECM is just one of nearly 1,100 local partner agencies Feeding America West Michigan supplies with food in 40 Michigan counties. Most of that food is donated to Feeding America West Michigan by farmers, grocery stores and food processors, with high-demand items like peanut butter, turkey and canned vegetables purchased as needed. Healthy food remains a central priority. 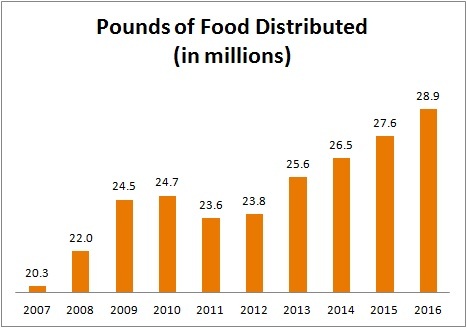 In that respect, 2016 was also a milestone year: For the second year in a row, fruits and vegetables accounted for 40 percent of the product the organization distributed. “As a food bank, we have a responsibility to the families we serve to make sure they have access not just to calories but to food that’s truly nourishing and sustaining,” Estelle said. Much of Feeding America West Michigan’s fresh produce, dairy products and other healthy, perishable foods are distributed directly to clients through its Mobile Food Pantry program. 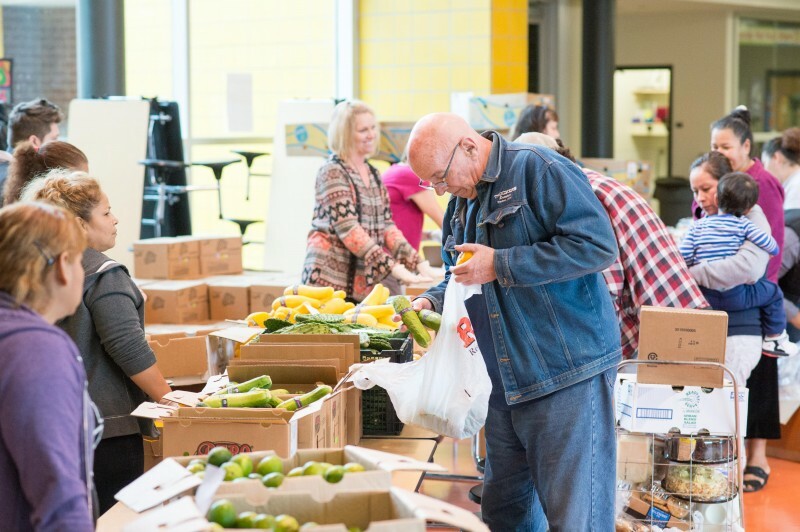 Boosted by grant funding from the Michigan Health Endowment Fund, the Mobile Pantry program grew by 10.2 percent in 2016, providing a total of 11.8 million pounds of food at 1,743 distributions. With the grant period coming to a close, Feeding America West Michigan is seeking new donors to ensure that those Mobile Pantry distributions continue in 2017. That support is urgently needed, as one in eight people in West Michigan and the Upper Peninsula struggles to put food on the table.